Air conditioners move heat from premise to be cooled to outside. Air conditioners blow cool air by pulling the heat out of that air. The air gets cooled by blowing it over a set of cold pipes known as evaporator coil. This works like an evaporation process. The evaporator coil is filled with a liquid known as refrigerant, which changes its state i.e. from liquid to a gas as it absorbs heat from the humidified air. The refrigerant is pumped outside the house to another coil where it throws its all heat and changes back to liquid state. This coil located outside is known as condenser because the refrigerant is condensing i.e. changing from gaseous state to fluid, similar to moisture on a cold window. 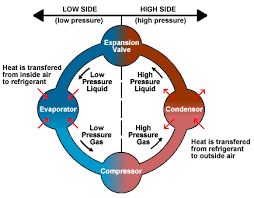 A pump, which we called compressor, is used to move the refrigerant between the two coils and to change the pressure of the refrigerant so that all the refrigerant evaporates or condenses in the appropriate coils. lets the system move much more energy than the compressor uses.